A major theme of the Joint Center’s 2015 State of the Nation’s Housing Report is the record growth in demand for rental units in recent years. 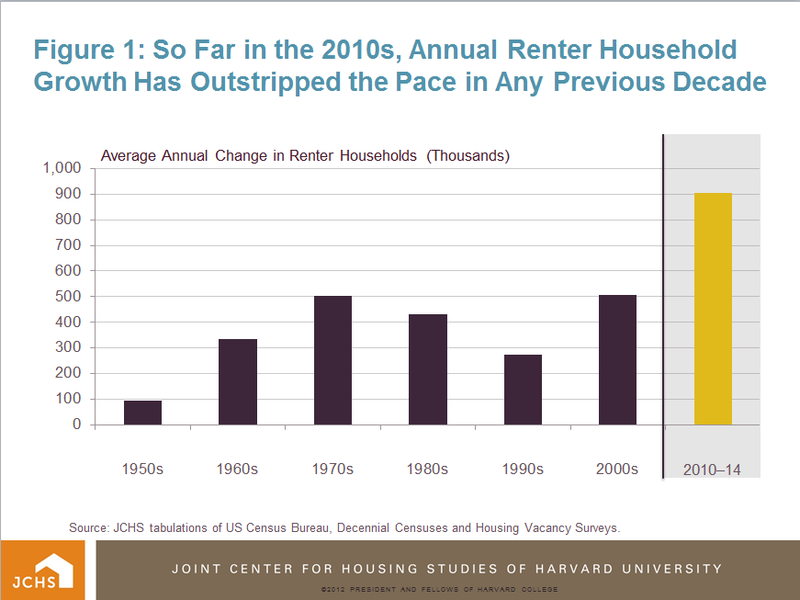 From 2010-14, the pace of renter household growth accelerated to 900,000 per year on average. 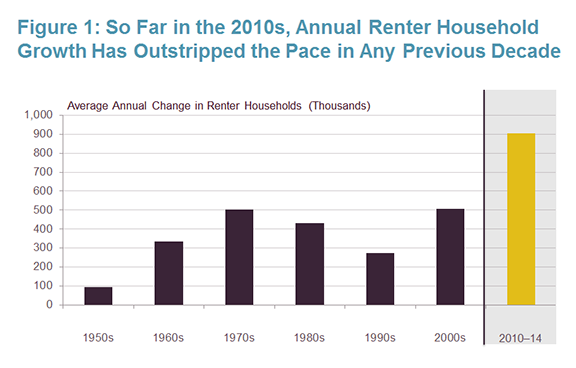 This puts the 2010s on track to be the strongest decade for renter growth in history (Figure 1). Relative to this surge in demand for rental housing, both the quantity and the pricing of new rental construction has been inadequate. Annual rental unit completions have ramped up over the past four years, but as of 2014 totaled only 280,000 new units—falling far short of annual growth in renters. In addition, the rising costs of development pushed the median asking rent for newly constructed multifamily units up to approximately $1,290 per month as of 2013, an increase of $180 in real terms compared to 2012 according to data from the US Census Bureau’s Survey of Market Absorption of New Multifamily Units. Source: JCHS tabulations of US Census Bureau, Decennial Censuses and Housing Vacancy Surveys. Meanwhile, typical renter incomes increased by less than half as much, or $60 a month, from $32,000 in 2012 to $32,700 in 2013 according to data from the American Community Survey. According to the standard definition of housing affordability, where rent should be equal to no more than 30 percent of income, the median or typical renter household could afford a maximum rent of just $820 per month in 2013. In other words, newly constructed units are truly out of reach for the typical renter household, with the cost of a typical new multifamily unit eating up 47 percent, or almost half, of its total income. To afford a typical new multifamily unit, a household would need to earn at least $51,440, but less than a third of renters earn this much. 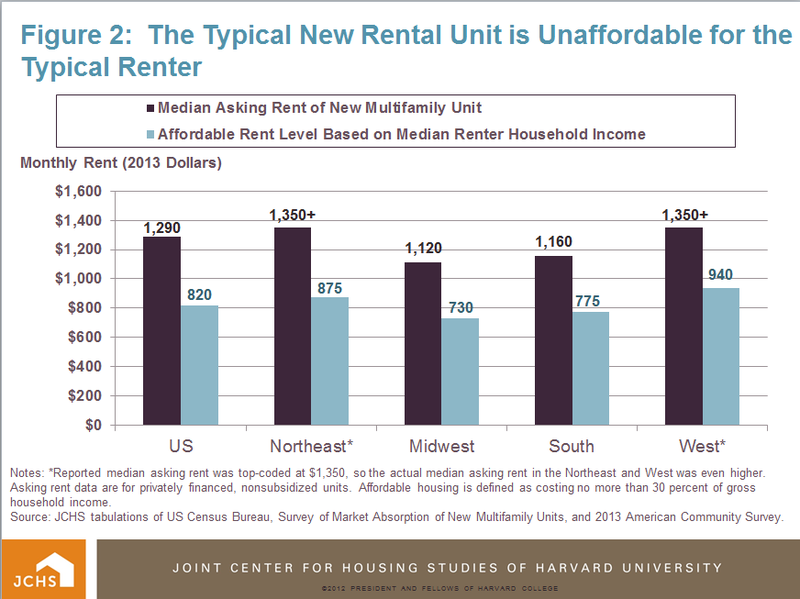 In 2013, the gap between the price of a typical new multifamily unit and what a typical renter could afford was large across all regions of the US, ranging from a difference of around $390 in in the Midwest and South to as much as $475 in the Northeast (Figure 2). 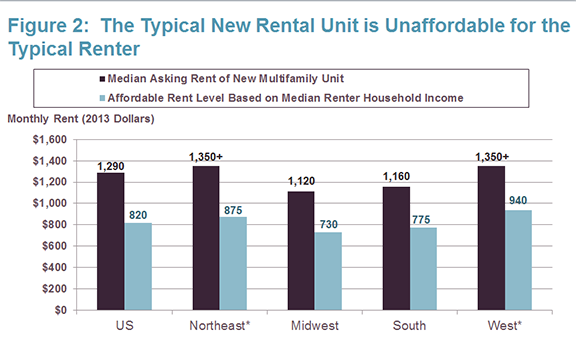 The Northeast and West saw the highest typical asking rents, of $1,350 or more per month. Notes: *Reported median asking rent was top-coded at $1,350, so the actual median asking rent in the Northeast and West was even higher. Asking rent data are for privately financed, nonsubsidized units. Affordable housing is defined as costing no more than 30 percent of gross household income. Source: JCHS tabulations of US Census Bureau, Survey of Market Absorption of New Multifamily Units, and 2013 American Community Survey. Unfortunately, reported rent data from the Survey of Market of Absorption is top-coded at $1,350, meaning that the actual median asking rent for units completed in these regions was even higher. For example, results from the American Community Survey suggest that among all units built in 2012-13 that rented at $1,350 or more, well over a third rented for at least $2,000 per month. This rent would require an annual salary of at least $80,000, placing such units even further out of reach of the typical renter. Fully 84 percent of new multifamily units in the Northeast and 67 percent of those in the West were priced at a monthly rate of $1,350 or above in 2013. In the South and Midwest, by comparison, new units in the $1,350+ rent range made up only about a third of growth, suggesting a more even regional supply of new units by price. If renters were simply upgrading from lower- to higher-cost housing, the concentration of growth in multifamily construction at the high end would not be a problem. But available evidence suggests that this is not the case. According to Joint Center analysis of Housing Vacancy Survey data, more than 90 percent of the decline in rental vacancies over 2013-14 was driven by the 12 percent decrease in the number of vacant, low-rent (i.e., less than $800 per month) units. And among professionally managed properties, higher occupancy rates were typically found among older units with lower rent levels. Data from MPF Research also suggest that as of Q4 2014, rents were increasing fastest among older, lower-rent units, further signaling rising demand for a shrinking pool of affordable units. Other analysis supplied by MPF Research indicates lease renewal rates have been rising over the past five years, as renters increasingly delayed the move to homeownership, leaving even fewer units to filter down to incoming renter households. Renters’ declining mobility is likely due to a mixture of several factors, including increased difficulty of qualifying for a mortgage, uncertainty about wage growth, debt burdens, and possibly even the difficulty of affording search costs (realtor fees, moving costs, etc.) for an increasingly small number of low-rent units. As of 2013, nearly half of renters were paying more than 30 percent of their income on housing, indicating that a significant share of renters have already hit a budget ceiling and are likely strapped in their efforts to find other affordable housing options. The result is that while new multifamily construction is easing some of the demand for new units, it is currently not sufficient to ease the broader affordability problems facing renters. Closing the gap between what it costs to produce this housing, and what economically disadvantaged households can afford to pay, requires the persistent efforts of both the public and private sectors. For more information on residential construction trends and the affordability challenges renters face, see our full report.